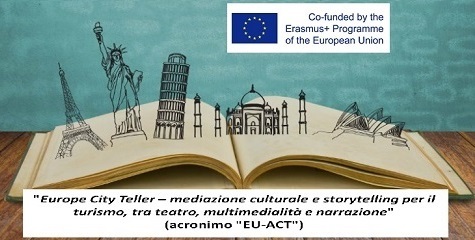 The project "Europe City Teller - cultural mediation and storytelling for tourism, between theater, multimedia and storytelling (EU-ACT) is a project approved by the Italian National Agency Erasmus Plus INDEX of the Erasmus Plus program KA2 Strategic Partnerships for adult education. The project intends to operate within the renewed context, which sees policies in the European cultural tourism sector, adapt to the new trends of tourists looking for authentic cultural experiences, with the aim of developing a quality offer, promoting local customs and traditions, paying attention to sustainability, protecting and enhancing the heritage, landscapes and local culture. The EU-ACT project intends to integrate itself into the transnational cultural tourism strategy promoted by the European Commission, which aims to carry out a series of activities to promote transnational tourism skills and products in relation to specific themes with significant growth potential and to respond to social concerns, to problems of territorial cohesion and of protection/enhancement of natural and cultural heritages.